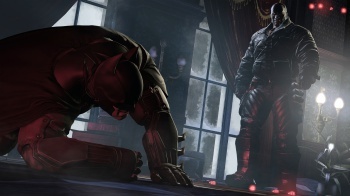 Batman: Arkham Origins' "I Am The Night" mode features no saves and only a single life. We at The Escapist remember a time where you had to hike forty miles uphill in the snow to the nearest health pick-up, and it seems that the folks over at Warner Bros. Games Montreal do, too. Speaking to Eurogamer, Batman: Arkham Origins producer Guillaume Voghel announced that the game will feature an ultra-hard masochists-only "I Am The Night" difficulty level, in which you cannot save your game and have but a single life. "We have a new difficulty level, New Game Plus is coming back - that's really difficult - and when you're done with that there's I Am The Night mode - which is no saves and one life." In the Eurogamer interview, Voghel also talks a bit about Initiation, the first piece of story DLC scheduled for the game. "You play as Bruce Wayne learning to be a ninja," said Voghel, adding that the DLC will be set in Asia. "That's a really cool one. Narratively there's some added content that will give players a little more background story." "[But] it's not League of Assassins, it's ninja-related," he continued. "It's when he learned to be a ninja and learned those techniques. He goes to a monastery - custom content was created for the DLC. You'll be in Asia in the monastery. The team did a great job on that, it looks really good." Voghel says that all of these features, plus around 12 hours of gameplay just from the main narrative arc and story missions, are there to help add replay-ability to the game.